Fall has just came and it’s time for us to welcome her! That means brainstorming and googling the hundreds of home decor ideas that can be realized in the spirit of this season. Fall means decorating our home in all things red, brown and orange, with pumpkins, leaves and wood. This kind of decor not only will welcome the season into your home, but it can also add rustic vibes into it. The best part of all is that there are so many easy DIY projects that can be done in no time and are budget – friendly as well. We present you ten of them, so just scroll along to find out! Instead of throwing away old jars, keep in mind that you can do so many creative projects with them. 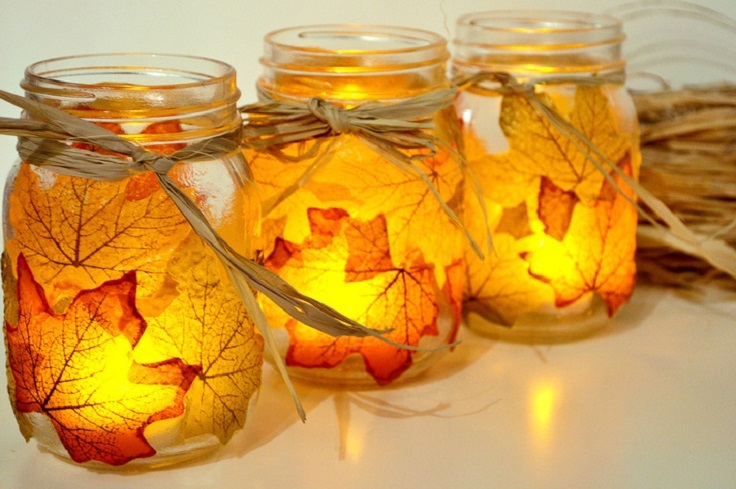 One of them is transforming the jars into fall decor that can be made in minutes. 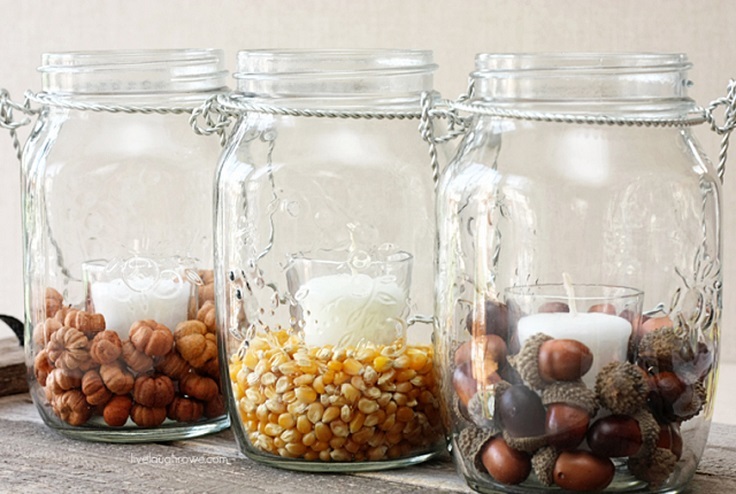 Take these three jars as your example – all you need is just popping kernels, acorn filler and a votive candle. So, all you need to do is just place inside everything. You can separate and each jar fill with one thing as pictured, or you can make a mix of them all! It’s up to you. Fall comes with increased consuming of hot beverages and everyone who likes their home neat, knows that having glass stains on the table can be really annoying! To solve this problem, all you need are coasters, but before you go and spend tens of dollars, consider making your own. That way you can add a little bit creativity to the way they look and come up with something that will totally fit the atmosphere. 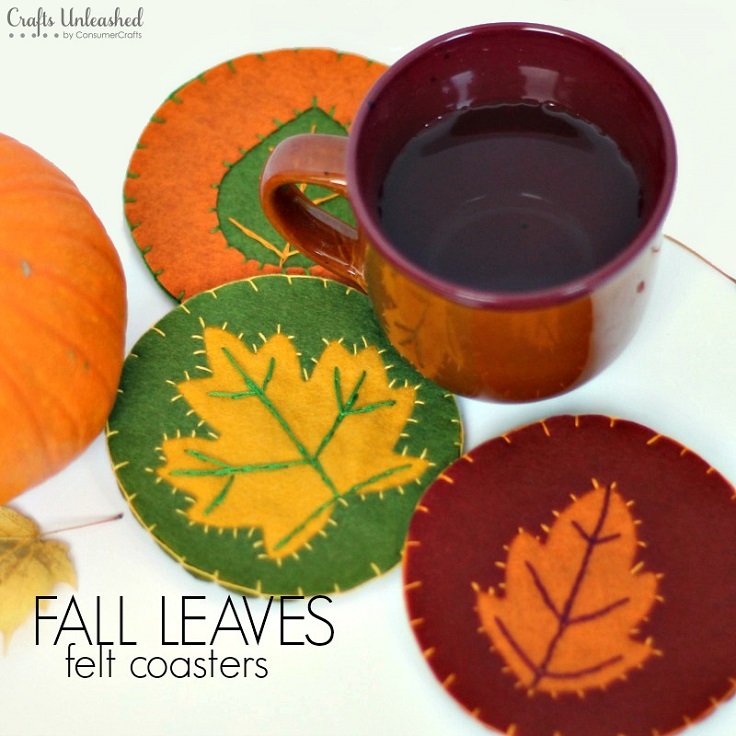 To make coasters such as these on the picture, you need felt (red, orange, yellow and green), embroidery thread, needle, water soluble marker, scissors and leaf template (you can download it via the link below the picture). Table runners can be such a nice way to decorate a table, instead of having the ordinary, nothing-new-to-offer centerpieces. 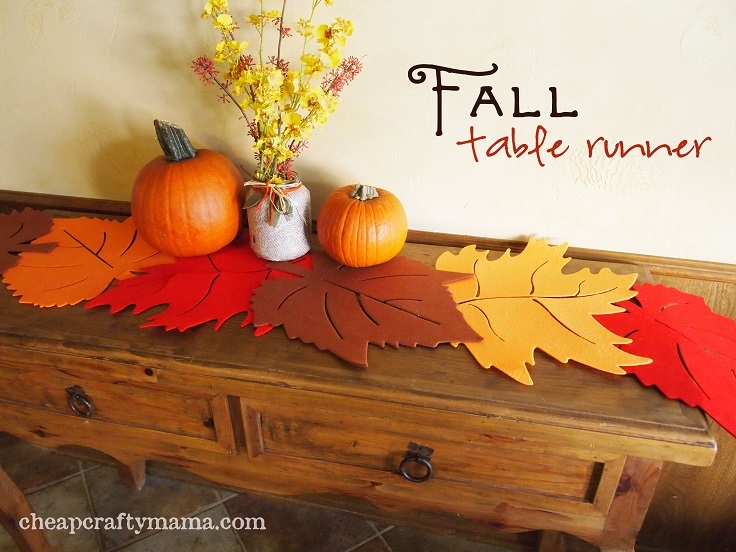 To make your own leaf table runner you need glue and felt leaf place-mats (or if you can’t find similar in stores, making your own and do the trick too). Arrange the leaves in the order you want and glue the parts of the leaves that overlap. You can also place heavy objects on top of the leaves to hold them together. When it’s well dried, you can place the table runner on any table you want to, and add few centerpieces for a whole new look! 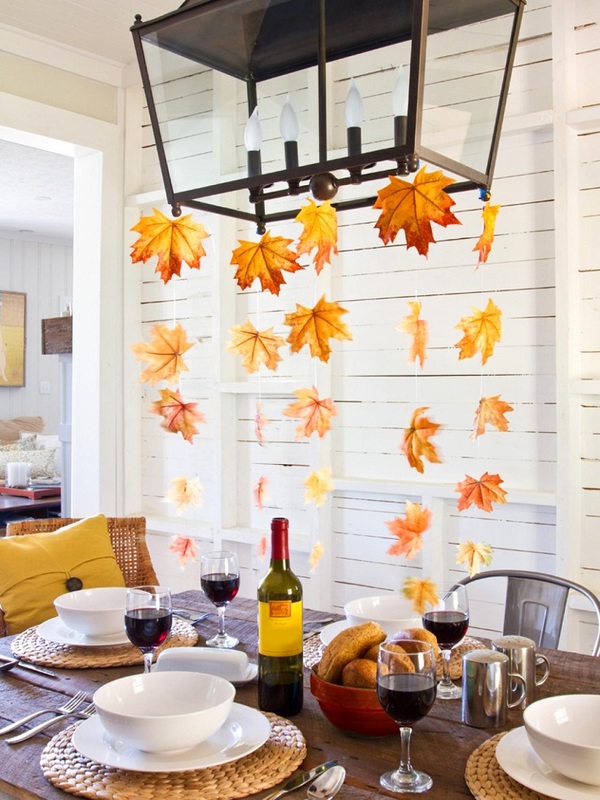 If you were looking for a decor that can fit your dining room, here’s one to consider – leaves streamers. This one is really easy to do it yourself and is definitely one of the budget – friendliest projects you can pick. It’s really fun because it means going out and picking leaves – a nice way to connect with fall, right? But, if you don’t want to do that you can go for store – bought silk leaves and make sure you also have these materials too: one spool of 8 lb. fishing line, scissors, hot glue gun and hot glue sticks, wax paper, painter’s tape and measuring tape. Using wood for home decor immediately adds rustic vibes to your house. It adds certain sense of warmth and home-sweet-home feeling. 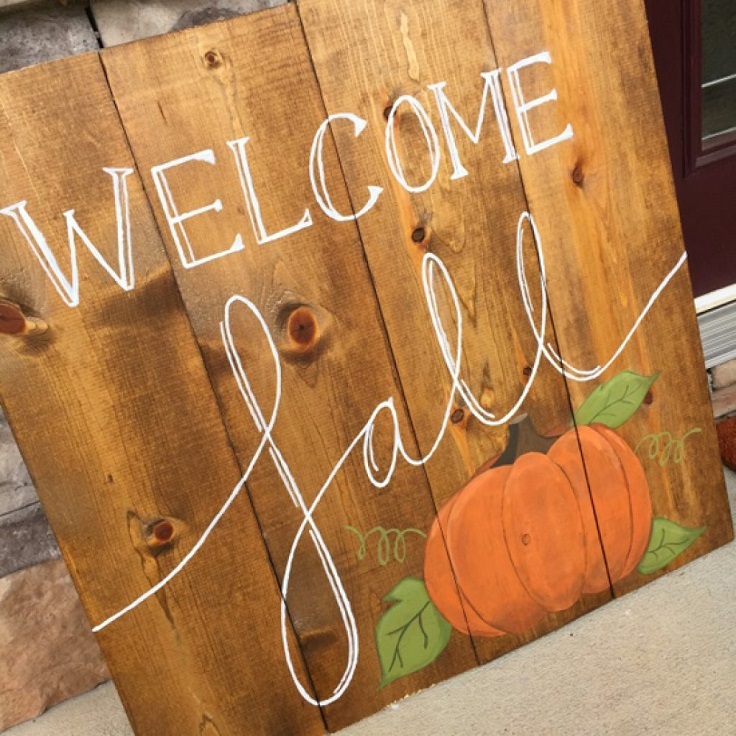 Besides that, a wood sign is an amazing, creative way to welcome the fall into your home! For this project, you need wood planks, corner brackets, paint, brushes and few tools to help you make the sign. When it comes to the painting, choose a line that suits you the best and if you feel like you need to, practice writing with paint aside, so that you will make it perfectly on the planks. 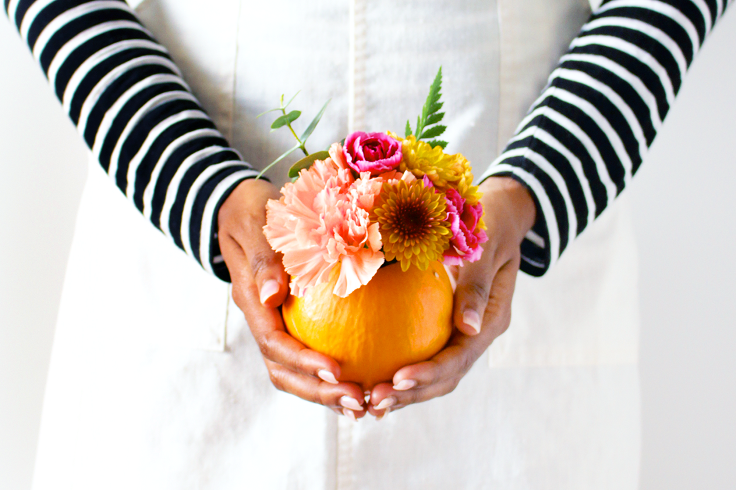 Pumpkins make great desserts, but they can serve as great vases too. Truth is, they look adorable this way! To make your own pumpkin vase, you need flower bouquet, mini pumpkins, floral foam, shot glass or tiny candle votive, knife and spoon. Scoop out the flesh and stems of the pumpkin, cut the floral foam in the shape of the shot glass and its size and preparing according to the instructions given on the package. After that, place the foam into the glass and one by one, insert the flowers and once you’re done arranging them, place the shot glass inside the pumpkin. 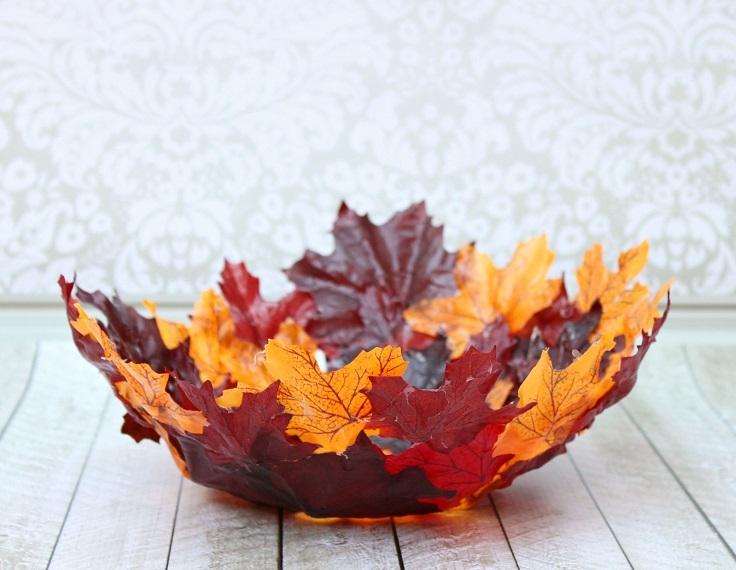 Looking for a leaf bowl? Here’s how you can make it – first get the needed materials, like artificial leaves, plastic bowl, Mod Podge Matte, Krylon Triple Thick Glaze and plastic wrap. Many try this project by using balloon instead of bowl, but it’s best to use a bowl because otherwise most likely you will find it hard to take off the leaves bowl from the balloon or it will collapse after you pop it. It’s really, really easy and it will take you less than a day to have it all done. Instead of using traditional fall colors, trying something else can work out so great! Here it’s all about using colorful fabric and pretty dollies. This might not be the best choice for a DIY beginner, but with patience and creativity, you will get through it! It’s really easy, all you have to do is just carefully follow the instructions on the website. 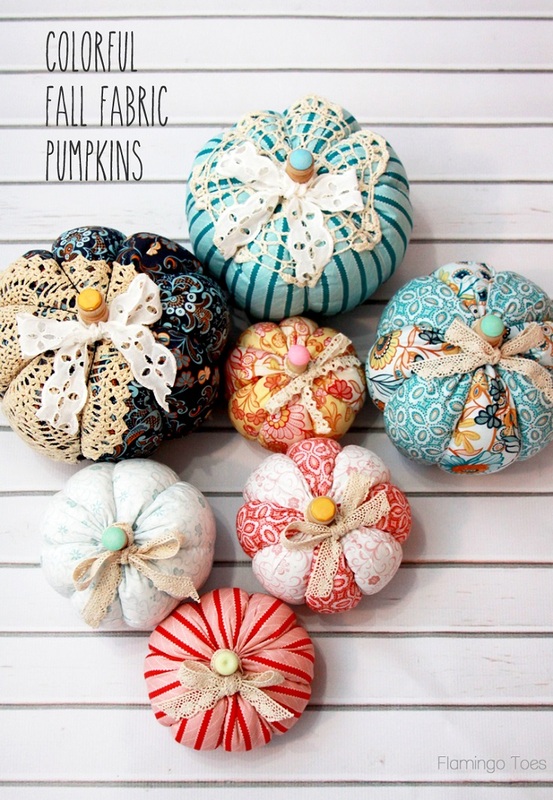 When you’re done and you have mini colorful pumpkins, arrange them around the house. It’s really amazing how an ordinary dried grapevine can be transformed into a nice fall wreath! Instead of throwing money on store – brought wreaths, presenting something that everyone have seen hundreds of times before, be your own creator and make your own. 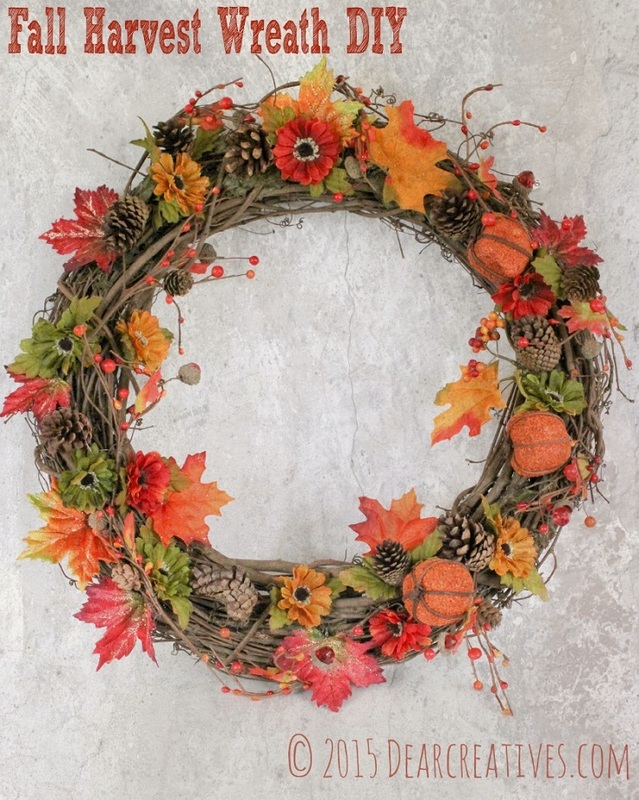 Just arrange different things into the wreath, like silk or dried flowers, leaves, mini pumpkins and other fall things. When you’re done, just create a wire hanger or use one you already have to hang the wreath. Your door will look very well – decorated like this! Who doesn’t want such amazing mason jars?! This is just another example on why you shouldn’t throw away old jars, especially when fall is happening. Leaves are getting colorful and falling down, so why not take advantage of that too? This project combines these two and with the help of a Mod Podge or similar, you can get amazing candle holders. Just clean the jar, add a layer of Mod Podge and stick a leaf onto it. Add another layer of Mod Podge on top of the leaf and repeat these steps with the rest of the leaves. This jar is going to be the perfect rustic decoration for this fall!